HARARE, Zimbabwe (CNN) -- Zimbabwe's new finance minister Wednesday complained that President Robert Mugabe's government is running on taxes and duties paid on beer and cigarettes. Biti said spending will outstrip Zimbabwe's income by almost $1 billion. As he presented his revised 2009 budget to parliament, Finance Minister Tendai Biti noted that "indirect taxes made up of customs and excise duty have contributed 88 percent of government revenue, which means that the government has been literally sustained by beer and cigarettes." "This is unacceptable," the minister added. Biti projected that revenue expectations for the year would come in at about $1 billion -- some $700 million less than the figure declared earlier this year by the former finance minister, a Mugabe appointee. 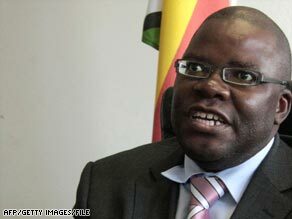 Biti is a member of the opposition Movement for Democratic Change party, which agreed to join a coalition Cabinet. Projected spending for the year would be more than $1.9 billion, Biti said, resulting in nearly a billion-dollar deficit. "We are now implementing the basic law of hunting economics," the minister declared. "What we gather is what we eat." Zimbabwe is in the throes of an economic crisis that critics blame on bad governance by Mugabe's administration since he came to power 29 years ago. Economists say skewed government policies, an often violent land reallocation program and corruption have milked the Zimbabwean economy, once the breadbasket of southern Africa. They also blame the current situation on overspending, due to the continued printing of the now-abandoned Zimbabwe dollar. Many are hoping that the recent formation of the power-sharing government that put MDC leader Morgan Tsvangirai in the prime minister's seat will create policies to ease the economic crisis.